I totally get the whole “sheer coverage” thing when it comes to foundation, and frequently, that’s exactly what I want. However, there are many times when what I want is full coverage – I’m talking balls out, totally smooth, completely uniform, no red marks, no red cheeks, pedal to the metal, maximum coverage. The problem is, it’s always been hard for me to find a full coverage foundation that doesn’t dry out my skin or make me look like I’ve just smeared spackle all over my face. Well, those days are over. Someone has finally made the perfect full coverage foundation, and that someone is Kat Von D. Yes, Kat Von D Lock-it Tattoo Foundation is the answer to all of my blotchy-faced problems. This foundation, like the rest of the Kat Von D makeup line, is something that I regrettably put off trying because I’m not really Von D’s target audience. But I kept reading raves about it in the makeup forums I frequent, and I had such tremendous luck with her eyeshadows that I decided it was time to give the Lock-it Tattoo Foundation a try. I also happened to be in need of a full coverage foundation when I purchased it, since the whole Rodial Bee Venom Moisturiser fiasco has left my face a red, splotchy mess, even after the cystic acne subsided. You’ll see what I mean in my before picture toward the end of this post. This foundation promises exceptional coverage, 24-hour transfer resistant wear, and a smooth finish. It boasts 21% percent pigment – I’m just going to have to take Kat Von D’s word for it that this is a lot of pigment. I mean, it sounds like a lot, but I have absolutely no clue what percentage of pigment my other foundations contain, and I never thought to ask. Water, Dimethicone, Phenyl Trimethicone, Trimethylsiloxysilicate, Aluminum Starch Octenylsuccinate, Polysilicone-11, Butylene Glycol, Isononyl Isononanoate, Silica Dimethicone Silylate, Dimer Dilinoleyl Dimer Dilinoleate, Dimethicone Crosspolymer, Glycerin, Isododecane, Sodium Chloride, Methicone, Glyceryl Caprylate, Calcium Carbonate, Sorbitan Sesquioleate, Trihydroxystearin, Potassium Sorbate, Methylpropanediol, Caprylhydroxamic Acid, Disodium Edta, Peg/Ppg-18/18 Dimethicone. May Contain (+/-):CI 77891 (Titanium Dioxide), CI 77492 (Iron Oxide), CI 77491 (Iron Oxide), CI 77499 (Iron Oxide). A quick peek at COSDNA tells me that the risk of this makeup causing acne or irritation is extremely low. It also doesn’t contain fragrance, a rarity when it comes to foundation. Those of you with fragrance sensitivities, rejoice! Lock-it Tattoo Foundation is for you! It does contain a lot of silicones, so if that’s something you avoid, Lock-it Tattoo foundation is probably not for you. But I will mention – silicones are pretty gentle, and it’s actually a very small percentage of folks who actually have a sensitivity to them. I used to think I was one of those people, until Tiffany at Cake-Pie pointed out to me that it could be something else that was appearing alongside the silicones in the products that were breaking me out. Thankfully, she was right (I strongly suspect fatty alcohols). Silicone molecules are too big to clog pores, and they form a nice barrier over the skin to prevent moisture from escaping. That barrier is also good at protecting your skin from outside dirt and elements. For some reason, this purple showed up in every single photo I took of the top of this bottle, no matter what I did with the lighting or surroundings. There is no actual purple in the packaging. The purple you see here is a phantom. Lock-it Tattoo foundation comes in a huge range of shades. I mean, huge. This is good news for my very dark and my very pale friends, since they are often left in the cold when it comes to foundation choices. Because of the wide range of shades, it’s really best to go to Sephora (the exclusive carrier of Kat Von D cosmetics) and get matched. The lighting in the stores is usually pretty weird, so it’s best to get matched and then take 2 or 3 samples home to try in various light. I, being the internet shopping enthusiast that I am, attempted to guess my match. I’m NC25 in MAC, for reference. It took me three tries to find the right shade. 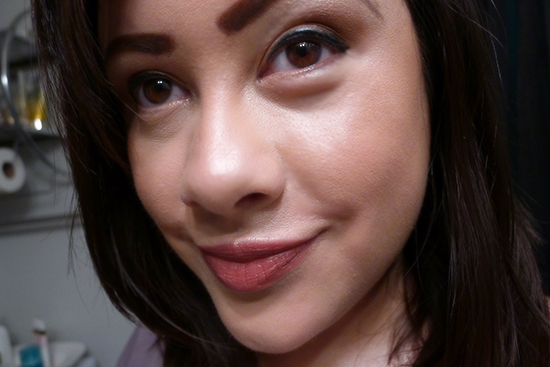 Initially, I tried Medium 54 (for medium complexions, with yellow beige undertones). That shade was way too yellow and dark, so I ordered the next shade down – Medium 52, which is said to be for medium/light skin with a warm beige undertone. That one was actually pretty close, but still a titch too dark and yellow. 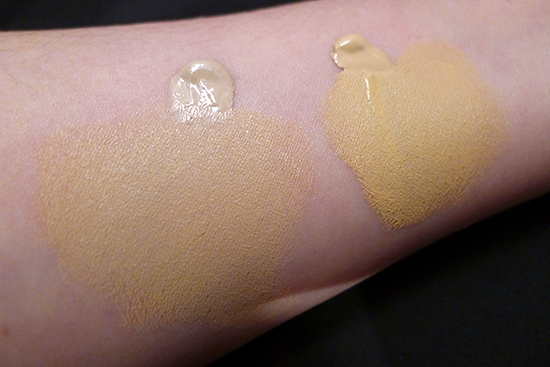 Finally, I picked up Light 48, which confusingly, is actually for medium complexions with beige undertones. Ding ding ding! This one was a perfect match. EDIT 09/01/2013: I got rematched at MAC, and I am actually a perfect NC15 or a very passable NW13 (Studio Fix Fluid Foundation), and not NC25 or NC20. My undertone is neutral edging on cool, which is why the Kat Von D Light 48 matches me so perfectly. 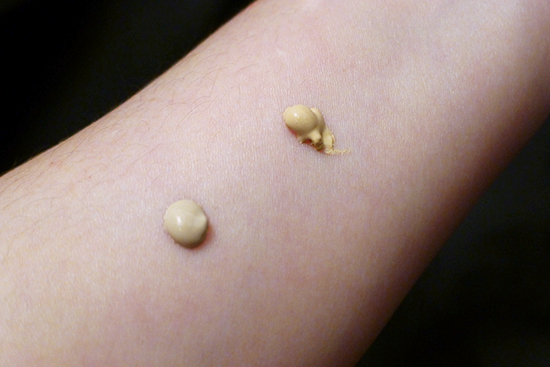 My fellow Asian beauties – if you keep getting matched for foundations that look too yellow when you get home, you’re probably getting matched with the wrong undertone. This article explains cool vs. warm tones for Asian skin very well. Worth a read if you’re Asian and living in the US (where I imagine this mismatch is much more common), or if you’re just curious how someone can be yellow and cool toned and the same time. *Please note that the underside of my arm is 2-3 shades lighter than my face. 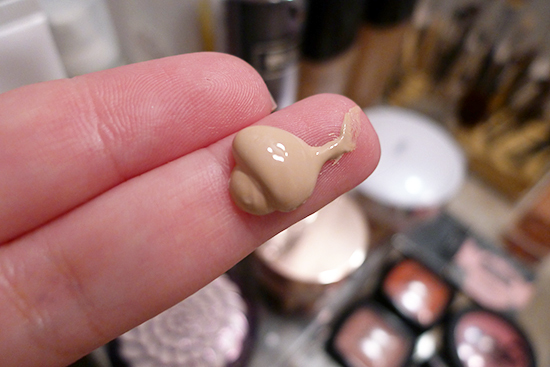 The first thing I noticed when I pumped this foundation out is that it’s extremely thick. Much thicker than any foundation or BB Cream I’ve ever owned. It was almost intimidating, but not so intimidating that I didn’t immediately smear it all over my face. This stuff dries quickly, so I had to work fast. Luckily, Lock-it Tattoo foundation is very easy to work with, so working quickly wasn’t a problem. The technique I found works best for me is to smear it over my face with my fingers, then blend it in with a big, fluffy foundation brush. This technique leaves me with a nice, smooth, streak-free airbrushed look, and allows me to use less product than I would if I used just my fingers to rub it in. The coverage for this stuff is simply amazing. It has a semi-matte finish that truly hides every single mark and blemish on my face. It even hid marks I didn’t know were there. Lock-it Tattoo Foundation made my face look flawless, and because I really didn’t need very much product to get full coverage, my face didn’t look like a lifeless mask. 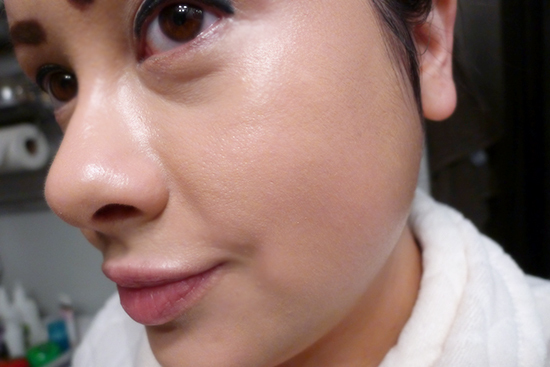 It also felt surprisingly light on my face – lighter even, than some of my BB Creams. This is my face, freshly moisturized and primed, with no foundation. It’s extra red and splotchy here because I’m healing from a product testing debacle. 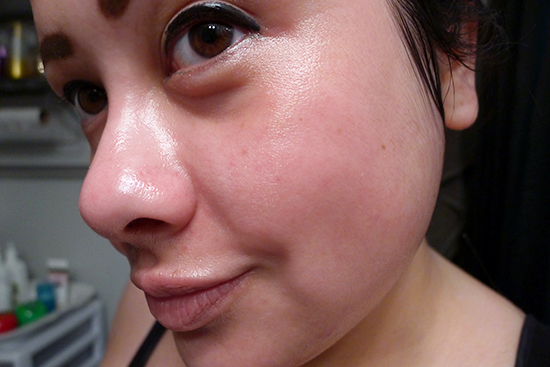 After: This is immediately after applying Kat Von D Lock-it Tattoo Foundation. This is the amount it took to cover my entire face. My fingers are small, so that blob is actually pretty tiny. The final win for Kat Von D Lock-it Tattoo Foundation is the fact that it did not dry me out. Or maybe it did, but it’s just so good at hiding my typical mid-day flakes that I didn’t notice. Either way, my skin never looked or felt dry. It was also never oily. This is my finished look, which doesn’t include a setting powder. This photo was taken about 6 hours after applying the foundation. Anyway, it’s pretty safe to say that I love this foundation. It might even be my new HG (Holy Grail). 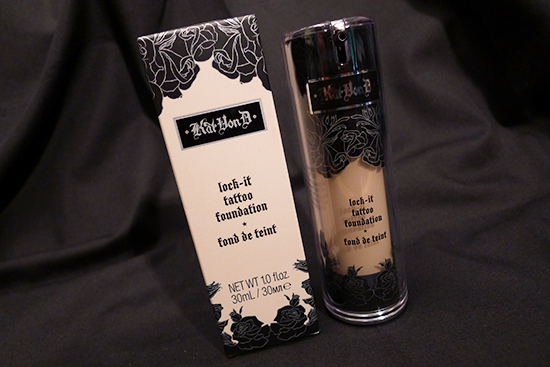 If you’d like to purchase Kat Von D Lock-it Tattoo Foundation ($34), it’s available at all Sephora stores and on Sephora’s website, but only when it’s not sold out. Seriously, this foundation sells out all the time. I understand why, now that I’ve used it, but I would really prefer it if Kat Von D’s production could keep up with demand. Performance: 5/5 – Full, non-cakey coverage that lasts all day. Non-oily, non-drying, and provides a smooth, flawless finish. Quality: 5/5 – Contains extremely gentle ingredients, safe for sensitive skin. 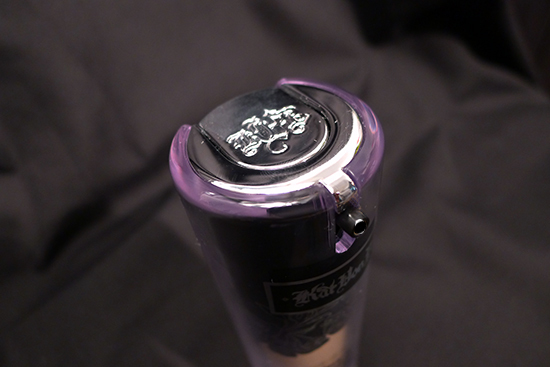 The packaging is very sturdy, and the pump dispenses exactly the right amount of product. Value: 5/5 – $36 for a solid, mid-range foundation that performs as promised is an outstanding value. Plus, a little goes a long way, so a bottle should last you a while! Note: This is the first time I’ve ever given any product a perfect 5-point rating. It’s just that damn impressive. This post contains affiliate links. Shopping through these links help support this site! Read full disclosure for details. Amazing. Your skin looks mannequin-perfect. This foundation has been at the top of my wishlist for a while now, and it just may be my next purchase post-no-buy. I really love that it has so many shades — but thanks for posting about your difficulty colour-matching on the fly. I always assume I’m just ‘lightest available’ but something tells me Kat caters to faces even paler than my own. Thanks! I hope you do wind up picking this up. I’d love to read your thoughts on it! Oh my, that Bee Venom sounds like it was a nightmare. I’m glad this foundation saved you! It looks gorgeous on your skin. Have you tried the Estee Lauder Double Wear? I love it for awful skin days, myself. Oh man, I love Estée Lauder, and Double Wear is a great makeup! Unfortunately, my skin type is to dry for it – Double Wear dries me out pretty badly, so I get some serious flakes about 2 hours in with that foundation. I wish I my skin type was more compatible with it- I love the finish it gives! Awesome review. I’ve heard a lot of good things about this foundation, and it LOOKS like it operates much like a bb cream, what do you think about how they compare? Your comments were a game changer for me. If it weren’t for you, I’d still be avoiding tons of products that I’ve ended up loving! In terms of BB cream comparison, this foundation has a lot more coverage and lasts longer without needing touch-ups. The only BB Cream I have that comes close to the amount of coverage this foundation has is Missha Cho Bo Yang – which I happen to love. Cho Bo Yang still doesn’t cover quite as much as this, and doesn’t last as long. Additionally, I often need a light dusting of setting powder for many of my BB Creams, but I don’t need any with this foundation. But my BB creams are still stars – Lock-it Tattoo Foundation doesn’t have any significant SPF, and of course, the BB creams are all loaded with it. Also, even though this foundation doesn’t dry me out, I don’t feel it’s as moisturizing as my BB creams. Additionally, it doesn’t have any long term skin care benefits. It’s not that the BB creams alone are working mind blowing miracles in the skin care benefit department, but I feel better knowing that the makeup I have on my face is actually helping improve my skin in some way. I love this foundation, but I expect that once my skin gets back to it’s normal state, I’ll go back to reaching for my BB creams regularly, and saving this stuff for when I need the big guns. With all the crap I try on my face, there’s no telling when I’ll need it! Great review! I had issues with this catching on my dry patches…may I ask what moisturizer you used underneath it? BTW is your skincare routine still with Cerave stuff like the post you did a while back? your skin looks amazing. Hey Dana! I can definitely see how this might catch on dry patches. I am currently trying a skin care line called Dr.Beauty Cell White by The Saem, and I believe I had just started using the moisturizer the day before this picture was taken. And yes, my “baseline” routine is still the Cerave and the natural oils. However, I’ve been trying new products for review non-stop for months, so I don’t think I’ve used my Cerave moisturizer since January! I tried this at sephora on my hand, and I didn’t like the way it smelled. Maybe because it was the tester or something? Or am I just sensitive? How weird! If I had to guess, I would say it was the tester. This foundation doesn’t have any fragrance in it, and it really just kind of smells like nothing to me. What did it smell like on your hand? When I bought this foundation at Sephora, the sales girl warned me that it doesn’t work with certain primers (I think she said silicone-based primers) and that the foundation will end up setting weird and slide off your face easily. Try it without the primer to see if that helps. Hi i love to read your reviews. I too have a neutral undertone to my skin and very close to your skin color as well. I wanted to ask does this foundation oxidizes after application and what other full coverage foundations similar to this one would you recommend? I have normal skin with just little oily on my t zone. Please reply. Hi Fazila! This foundation does not oxidize at all on me. That’s one of the many things I like about it! If you’re looking for other full coverage options, I highly recommend the new Guerlain Tenue de Perfection! The coverage is beautiful, and though it’s definitely full coverage, the finish looks very natural. It’s non-drying but also non-oily. It doesn’t oxidize, and it also lasts all day – I’m currently going on 10 hours wear with no signs of fading. I’ll be doing a full review of it soon! I’ve been trying to decide whether to buy this foundation or not. I went to Sephora and they origonally told me I was not a match and then I looked at my IQ thing and I was. I went and got a sample of the light 48 and its perfect for me. Im a cool beige with red undertone but this works really well for me. I only wish that the sample they gave me I could see how it warms up on my hand because its in a round plastic case that I cant put on my hand very easily. I did notice it does dry very quickly which I like. I think I’m going to purchase a round blending foundation brush to go along with it though because the one i have doesn’t blend this make up well at all. Hey Ashlyn! I think this is a great foundation and is definitely worth a shot. What brush are you considering to go with it? If you were to use a setting powder which one would you recommend to use? And do you set it with setting spray? That 52 wasn’t too dark, I’m very white and I use it perfectly fine. Just curious what primer did you use in this ? …what primer do you like to use now ? I brought this foundation in London after being wooed over when the lady in the shop tried it on me with the contour palette ( thats all i came in for). I love the foundation overall. I dont wear it often, i own the nars radiant foundation however that one dries out my skin. The only downside to this one is that it comes off quite easily on my skin, even with using the kat von d primer and the powder which i got a sample of.